With 8 different sizes we have the size that will fit your application. Multiple colors allow you to quickly identify each gage or instrument by department, due date or location. 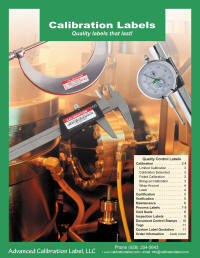 If a full calibration is not required these Verification labels insure that the instrument is within tolerance. Available in either in green or blue in two sizes. Newly added is the 'VALIDATED' label. Available in 2 sizes and multiple colors. 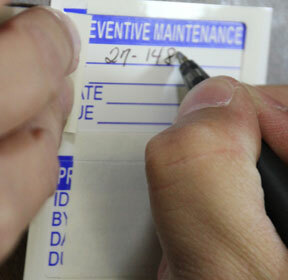 Also dedicated labels for Electrical Safety, Tested and Serviced. Available in 2 sizes in green, again with those covers! Ensure each instrument and gage in your system is used correctly. 'For Reference Only', 'Calibrate Before Each Use'', 'Out of Calibration DO NOT USE' and other useful titles. Popular versions are available with bilingual text. 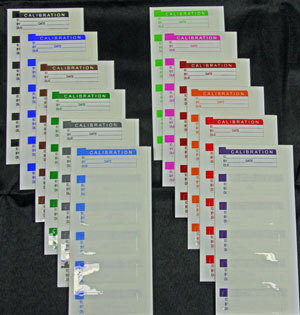 Labels in both vinyl and paper to identify the status of all material. Includes manila tags with attached wires. If you can't find the label you need we will make one for you. Add your company name and contact information so they will keep coming back. This page has some great information on adhesive performance and how to improve it in your application. 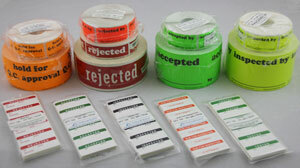 We have also added links to files to get you started in printing our QLL desktop laser labels. New cart packed with features! 1. Search function located at bottom of each page. You can search by part number or description. Select from the results and add right to the cart after selecting color and/or size. 2. Online shipping cost calculations. Select the method of shipment and get an estimate. 3. Quantity discounts calculated as you add items into the cart. A quantity discount is applied when total number of each item exceeds 24, 49 or 99 packages. 4. Optional customer login remembers your information so you do not need to re-enter on each order. Also you can view previous orders. How many did you order last time? No Problem! If you have a comment or suggestion, let us know in the feedback booth. Need a print version of all of our products? Download a 11MB PDF file here. Our calibration labels are designed to survive in the worst of environments. The vinyl base with permanent acrylic adhesive does well on the manufacturing floor. Add the protective cover and you have a label that will last!